Mesut Ozil produced one of the best midfield displays in the Premier League this season as Arsenal beat Leicester for a record-equalling 10th successive win in all competitions. Ozil's first-time finish for the equaliser, the pass that led to the second goal and his two flicks in the build-up to the third were the catalyst for a remarkable performance by the Gunners, who had been overwhelmed by Leicester in the opening 30 minutes. Their goal came from a pacy counter-attack, which resulted in Ben Chilwell's attempt at a low cross being turned in by the boot of Arsenal's Hector Bellerin. The Gabon international's second followed one of the moves of the season. Ozil's audacious flick in midfield set it in motion, before a sand-wedge of an assist by the German gave Aubameyang a simple finish. 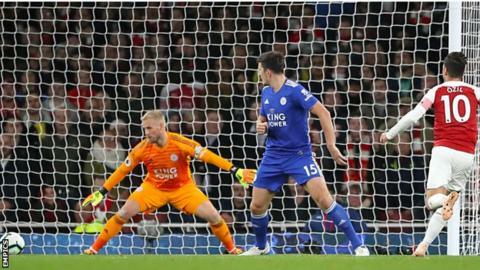 Alexandre Lacazette should have added another but his shot, from Ozil's pass, was saved at point-blank range by Kasper Schmeichel. Match ends, Arsenal 3, Leicester City 1. Second Half ends, Arsenal 3, Leicester City 1. Attempt blocked. Rachid Ghezzal (Leicester City) left footed shot from the right side of the box is blocked. Assisted by Wilfred Ndidi. Attempt missed. Rachid Ghezzal (Leicester City) left footed shot from the right side of the box is high and wide to the left. Assisted by Wilfred Ndidi. Jamie Vardy went off injured after Leicester City had used all subs. Offside, Arsenal. Granit Xhaka tries a through ball, but Alexandre Lacazette is caught offside. Attempt missed. Alexandre Lacazette (Arsenal) right footed shot from the centre of the box is close, but misses the top right corner. Assisted by Alex Iwobi. Attempt saved. Alexandre Lacazette (Arsenal) right footed shot from very close range is saved in the bottom left corner. Assisted by Mesut Özil. Substitution, Leicester City. Rachid Ghezzal replaces Ricardo Pereira. Attempt missed. Héctor Bellerín (Arsenal) right footed shot from the right side of the box misses to the left. Goal! Arsenal 3, Leicester City 1. Pierre-Emerick Aubameyang (Arsenal) right footed shot from very close range to the centre of the goal. Assisted by Mesut Özil. Marc Albrighton (Leicester City) is shown the yellow card. Goal! Arsenal 2, Leicester City 1. Pierre-Emerick Aubameyang (Arsenal) right footed shot from very close range to the centre of the goal. Assisted by Héctor Bellerín. Substitution, Arsenal. Pierre-Emerick Aubameyang replaces Stephan Lichtsteiner. Substitution, Arsenal. Matteo Guendouzi replaces Henrikh Mkhitaryan. Wilfred Ndidi (Leicester City) hits the bar with a header from the centre of the box. Assisted by James Maddison with a cross following a corner. Corner, Leicester City. Conceded by Alex Iwobi. Offside, Arsenal. Shkodran Mustafi tries a through ball, but Alexandre Lacazette is caught offside. Attempt missed. Henrikh Mkhitaryan (Arsenal) left footed shot from the centre of the box is too high. Assisted by Alex Iwobi. Attempt missed. Henrikh Mkhitaryan (Arsenal) left footed shot from the centre of the box is close, but misses to the left.